Born in Green River, Wyoming, on July 31, 1919, Curtis Edward Gowdy grew up in Cheyenne, Wyoming. At a young age, Gowdy developed a deep love of sports. He followed baseball, basketball, and college football in the daily newspapers. Though more than a thousand miles away, the Gowdys were able to hear Los Angeles radio station KFI, where young Curt was first introduced to the play-by-play descriptions of pioneer broadcasters like Graham McNamee and Ted Husing. Gowdy remembered years later, “The first sports announcing I ever did was in my own room with the door closed. My dad gave me a football game where you shook the dice and guessed what was coming up. I pretended I was Ted Husing, announcing the plays with all their ramifications.” Gowdy’s father, Edward, a dispatcher for the Union Pacific Railroad, encouraged Curt’s fascination with sports, taking him to University of Wyoming basketball games and occasionally sneaking away from work early to take him fly fishing. Gowdy’s mother, Ruth (née Smith), ensured that Curt’s love of sports did not consume all of his attention. She encouraged him to persevere in his studies. When Gowdy was 10, his mother enrolled him in elocution lessons, something he later said helped him in a career spent talking to the public. Graduating from high school in 1937, Gowdy worked as an electrician’s apprentice for the Union Pacific for a year before entering the University of Wyoming at Laramie. He quickly discovered that he loved the area for the opportunities it provided for him to fish. Years later he recalled, “One of the things I liked best about Laramie was that you never needed much spare time to go fishing because there were little streams all over the place.” Besides spending his spare moments fishing, the young college student found time for basketball, making the varsity team in his sophomore year. Diagnosed with spinal arthritis, Gowdy underwent surgery at the Mayo Clinic shortly after his military discharge. After spending several months recuperating from his surgery, he landed a job at the sports department of the Wyoming Eagle, covering local sports. The newspaper job led to his being hired by radio station KFBC in Cheyenne to provide color commentary for high-school football games. On a cold November day in 1943, Gowdy got his chance to do play-by-play for the first time, describing a game between two high-school six-man football squads. Setting up soapboxes to place his equipment on, Gowdy described the game from ground level at midfield. Recalling the game years later, he couldn’t remember the final score but said, “I never walk into a comfortable, heated booth without thinking of the soapboxes at midfield in the freezing playground four blocks from my house.” Gowdy went on to broadcast high-school basketball games later that year. In the summer of 1944, he began broadcasting re-creations of major-league baseball games. “Of all the broadcasting jobs I ever did in Cheyenne, re-creating ball games gave me the greatest thrill,” he later wrote. When broadcaster Russ Hodges left the New York Yankees for the New York Giants after the 1948 season, the Yankees began a nationwide search for his replacement. Gowdy was told he was one of many broadcasters being considered for the position. To help his cause, Gowdy put together a tape of himself broadcasting the 1948 Texas League All-Star game and also had an expensive brochure made to promote himself. “By judicious use of pictures, newspaper clippings, banquet programs, and everything else,” the brochure was designed in a way that Gowdy said “made me look like the second coming of Red Barber.” While in New York with the Oklahoma A&M basketball team, Gowdy met with Yankees officials (including Mel Allen) in December 1948. Three weeks later, he was hired. Beginning in 1949, Gowdy became a broadcaster for the New York Yankees. Not only was 1949 a turning point in Gowdy’s professional career, but in his personal life as well. On June 24, he was married to Geraldine “Jerre” Dawkins, whom he had met in Oklahoma. The wedding was held in Central Presbyterian Church on Park Avenue in New York, and Mel Allen served as Curt’s best man. The marriage lasted until Curt’s death nearly 57 years later. Curt and Jerre had three children: Cheryl, Curt Jr., and Trevor. Curt Jr. became a noted television producer. Covering the Yankees, the Wyoming native soon realized there was a great deal of difference between his prior experience and working in New York. “The tremendous pressure of working in the biggest, most important advertising market in the world scared me,” Gowdy wrote later. “The pressure was almost a physical thing, a trap waiting to be sprung, a Sword of Damocles hanging over my head. It undermined my confidence.” His broadcast partner, Mel Allen, helped build Curt’s confidence and taught him the finer points of baseball strategy as well as how to be a better sportscaster. Gowdy appreciated the help, stating years later that Mel was his mentor. Gowdy kept busy covering other sports as well. When the 1949 baseball season ended, he hosted the Football Scoreboard show on CBS, broadcast college basketball games from Madison Square Garden, and provided play-by-play for the NCAA championship over CBS television in the spring of 1950. During the winter of 1950-51, Gowdy and Don Dunphy hosted a television show called DuMont Saturday Night which featured such events as basketball, rodeos, and track meets. As the 1951 season approached, Gowdy learned that there would be an opening in the Boston Red Sox broadcast booth. Boston announcer Jim Britt had previously covered the home games of both the Red Sox and Braves. Beginning in 1951, each team planned to have its own broadcast crew providing coverage of all home and road games. Britt would be covering the Braves games. Gowdy, interested in being the No. 1 voice for the Red Sox, approached Red Sox general manager Joe Cronin about the job. When Cronin, who was familiar with Gowdy’s work, hired him, Red Sox owner Tom Yawkey welcomed Gowdy, telling him, “Don’t let criticism bother you. You’ll get plenty. You’re a Westerner with a New York background, fresh from the hated Yankees. That won’t sit well at first with a lot of New Englanders, but they’ll get over it.” It didn’t take long for Gowdy to be embraced by Red Sox fans all over New England. In early 1966, Gowdy left the Red Sox to sign with NBC, becoming its main television broadcaster for baseball. By this time, he had achieved national recognition, handling the TV coverage for the network telecasts of the World Series in 1958 and 1964, as well as several All-Star Games. Joined by such partners as Pee Wee Reese, Tony Kubek, and Joe Garagiola, Gowdy provided play-by-play for NBC’s Game of the Week, All-Star, and World Series telecasts from 1966 to 1975. In all, he worked 78 World Series telecasts, a record that stood until it was surpassed by Tim McCarver in 2003. In November 1975, after 10 years as the top network baseball voice, Gowdy was dropped from NBC’s baseball coverage. The network’s decision was partly due to the fact that NBC was cutting back on its baseball coverage, but was seen by some as a sign that Gowdy had been over-exposed by doing so much television work. Gowdy still continued to cover football, basketball, and other sporting events for the network, but his role on broadcasts became less substantial. By 1978, he had gone from being the play-by-play voice of the college basketball championship to appearing briefly as a pregame host. Passed over for play-by-play duties, he was given an assignment as a roving reporter during the 1978 World Series. It was an assignment he did not enjoy. “It was a difficult spot, and I don’t think I’d do it again,” he said after the Series. “I had no monitor, so I didn’t get to see the picture, and roaming around the stands I often didn’t get to hear what was being said, either. At Yankee Stadium, I was mobbed by kids looking for autographs. It was not the easiest situation in the world.” Six months later, Gowdy left NBC. Signing a contract with CBS in April 1979, Gowdy spent two years covering the network’s telecasts of professional football games. In 1981, he was dropped from CBS television sports. Gowdy, now 62, seemed ready to cut back on his travel schedule. “There’s no big unhappiness on my part that I’m not going to be back,” he said. “When I started with CBS they wanted me for 35 appearances a year, but I only signed for 25. I’m at a time in my life when I wanted to have more control over my life. I’ve averaged 350,000 miles of traveling a year for 35 years, my children are grown up and my wife is alone too much when I do that much traveling.” Though dropped from television, he remained active on CBS radio. Teaming with Ernie Harwell on the radio network, Gowdy did play-by-play of the American League Championship Series in 1980, 1981, 1983, 1985, and 1986. He also provided play-by-play for the CBS Radio Game of the Week in 1985 and 1986. Though he had fewer play-by-play assignments, Gowdy’s schedule remained busy. Besides his American Sportsman show, Gowdy also hosted a PBS sports nostalgia program, The Way It Was. By the early 1980s, he was the owner of five radio stations. He also served as president of the Basketball Hall of Fame from 1978 to 1985. In 1987, he worked as the radio voice of the New England Patriots football team. Broadcasting football for the Patriots was a return to his roots. It was the first time he had covered a Boston-area team since leaving the Red Sox and the first time he had broadcast football on radio since the 1954 Cotton Bowl game. During his long career, Gowdy became one of the most acclaimed sportscasters in history. For his contributions to baseball broadcasting, he received the Ford Frick Award from the Baseball Hall of Fame in 1984. He was also given awards for exceptional contributions to broadcasting by the Football and Basketball Halls of Fame. Eventually, the Basketball Hall of Fame named its media award in his honor. In 1970, Gowdy became the first sportscaster to receive the George Foster Peabody Award for achievement in broadcasting. Gowdy was also inducted into the Red Sox Hall of Fame, the International Game Fish Association’s Fishing Hall of Fame; a state park in Wyoming was named for him in 1971. On May 21, 2003, Gowdy returned to the booth at Fenway Park as a special guest on an ESPN broadcast of a Red Sox game. His final visit to Fenway came on August 28, 2005. Before that night’s game, the 86-year-old former Red Sox voice was honored by the team and given an ovation by the crowd. Six months later, Dr. Charles Steinberg, the Red Sox executive vice president of public affairs, said, “We knew he was in failing health, and we wanted fans to have an opportunity to show their appreciation with their ovation. Often, announcers don’t get to enjoy the live reaction to their words or voice, and we had an opportunity to provide that to him. 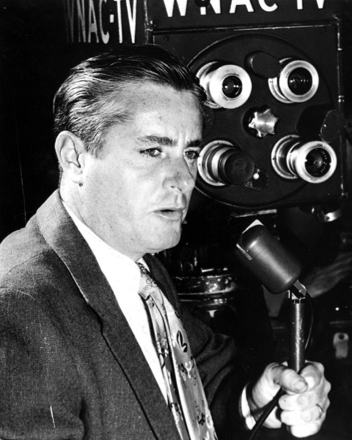 It was a memorable moment.” Curt Gowdy died of leukemia on February 20, 2006, at his home in West Palm Beach, Florida. Red Barber, The Broadcasters (New York: The Dial Press, 1970). Stephen Borelli, How About That! The Life of Mel Allen (Champaign, Illinois: Sports Publishing, 2005). Curt Gowdy and Al Hirshberg, Cowboy at the Mike (Garden City, New York: Doubleday & Company, 1966). David J. Halberstam, Sports on New York Radio: A Play-by-Play History (Chicago: Masters Press, 1999). Wesley Hyatt, The Encyclopedia of Daytime Television (New York: Billboard Books, 1997). Ted Patterson, The Golden Voices of Baseball (Champaign, Illinois: Sports Publishing, 2002). Ted Patterson, The Golden Voices of Football (Champaign, Illinois: Sports Publishing, 2004). Dave Anderson, “Larry Barnett and the TV Announcers,” New York Times, November 15, 1975. Associated Press, “Garagiola replaces Gowdy at NBC,” Frederick (Maryland) Post, November 22, 1975. Associated Press, “Curt Gowdy Pulls Shock, Agrees To CBS Offer,” Indiana Evening Gazette, Indiana, Pennsylvania, April 6, 1979. Associated Press, “Gowdy to Be Honored By Basketball Hall,” New York Times, April 16, 1978. Associated Press, “Gowdy To Continue Radio Broadcast of Sooner Games,” Lawton (Oklahoma) Constitution, April 23, 1948. Associated Press, “Spinal Ailment Shelves Curt Gowdy,” Newport (Rhode Island) Daily News, June 25, 1957. “At 80, Gowdy Still the American Sportsman,” New York Post, February 3, 2002. Jim Baker, “Hall’s old hat for veteran Gowdy,” Boston Herald, May 19, 2000. William Barnard, “Gowdy is cut after 35 years,” Chillicothe (Missouri) Constitution-Tribune, July 30, 1981. J. D.Bether, “Gowdy Not Bitter Over NBC Ouster,” Oakland Tribune, August 19, 1976. Scott Binning, “Wyoming will honor sportscaster Gowdy,” Billings (Montana) Daily Gazette, March 26, 1972. Nelson Bryant, “‘Sportsman’ in 20th Season,” New York Times, February 26, 1984. Nelson Bryant, “Wood, Field & Stream; Gowdy Heads Anglers’ Group,” New York Times, March 29, 1974. Norm Clarke, “He’s Hard to Describe,” Billings (Montana) Gazette, August 3, 1969. Jack Craig, “Gowdy a Happy Patriots Rookie,” Boston Globe, April 17, 1987. Jack Craig, “Gowdy’s Magic Pulls a Disappearing Act,” Boston Globe, November 6, 1987. Jack Craig, “Gowdy Quitting as Patriot Voice,” Boston Globe, January 22, 1988. Jack Craig, “No Baseball in ’76; Super Star Curt Starts to Fade,” The Sporting News, December 6, 1975. Steve Dorsey, “Gowdy tops Hall of Fame inductees,” Palm Beach (Florida) Post, February 20, 2007. David Elfin, “Gowdy Tires of Sports Hype,” Syracuse (New York) Post-Standard, February 12, 1986. Bob Foster, “Curt Gowdy was sure the A’s would win,” San Mateo (California) Times, October 12, 1973. Don Freeman, “Gowdy: Rhythmic Growler Is Tireless,” Lawton (Oklahoma) Constitution, November 7, 1976. “Gowdy returns to booth tonight,” St. Petersburg (Florida) Times, May 21, 2003. Willie Howard, “Inductees Gowdy, Martin tell fish tales,” Palm Beach (Florida) Post, October 29, 2003. “Hub mourns broadcast legend Gowdy,” Boston Herald, February 21, 2006. Mike Jackson, “Gowdy: A true outdoorsman,” Chicago Daily Tribune, February 23, 2006. Charlie Meyers, “Gowdy remains true to Wyoming roots,” Denver Post, February 19, 2002. “NBC Drops Gowdy From TV Baseball,” New York Times, November 22, 1975. Dana Oppedisano, “Pesky knew Gowdy had right touch,” Alton (Illinois) Telegraph, February 22, 2006. Bob Rubin, “Curt Gowdy is kicked upstairs,” Elyria (Ohio) Chronicle-Telegram, October 22, 1978. Richard Sandomir, “Curt Gowdy, a Seminal Announcer of Big Games on Television, Is Dead at 86,” New York Times, February 21, 2006. Richard Sandomir, “Two Generations of Reminiscences by Gowdys,” New York Times, January 24, 1995. Larry Siddons, “‘Sportsman’ returns for 18th season,” Chicago Daily Herald, April 3, 1982. B.J. Small, “Happy hunting, Curt Gowdy! True American sportsman,” Gettysburg (Pennsylvania) Times, March 4, 2006. Howard Smith, “Don’t overdo it … Keeping Super Bowl simple is Gowdy’s aim,” Anderson (Indiana) Daily Bulletin, January 6, 1977. “Sports Legends Still Awe Gowdy,” Albuquerque (New Mexico) Journal, February 13, 1977. “TV vet McCarver works record 79th Series game,” Syracuse Post-Standard, October 24, 2003. Howard Ulman, “TV-radio legend Gowdy dies at 86,” Elyria (Ohio) Chronicle-Telegram, February 21, 2006.